Here in Kelowna,the heart of the Okanagan Wine Country, The Vibrant Vine Tasting Room is a place to share a moment to enjoy tasting some outstanding wines. It is a boutique family run winery started in 2008 as a ‘retirement’ project and has since become somewhere that people come to enjoy the finer things in life. The Vibrant team of welcoming staff members,the award wining wines, the amazing 3D art, and the many music performances, are part of what makes this a truly unique place to visit. Bubbles and Petals tour of Okanagan Villa Estate Grounds. By appointment. 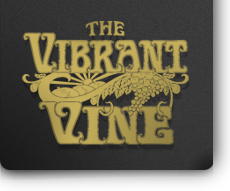 The Vibrant Vine Wine Club. Down Under Snack Shack open during Vibes at The Vine (every weekend in summer) and other occasions. Weekly complimentary selection. Fee for Proprietors Tastings. 11 a.m. – 5 p.m., daily, in summer; noon – 4 p.m., Saturdays, in winter.